Hibs have rejected a bid from Nottingham Forest for midfield star John McGinn. Forest manager Mark Warburton is a big fan of the 22-year-old Scotland internationalist and has already raided the Edinburgh club this summer, signing prolific striker Jason Cummings. McGinn has been a key player for Hibs since his arrival from St Mirren in 2015 and was subject to a reported £1 million bid from Ipswich Town earlier this summer. His contract at Easter Road runs until 2019. 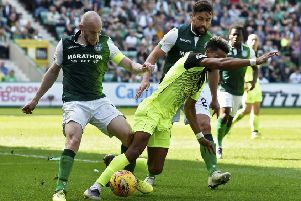 Neil Lennon confirmed the bid – belived to be for £750,000 – had been rejected, saying: “A bid came in for John but it was nowhere near our valuation of the player. It was laughable. “They need to come back with far more money than what they’re offering at the minute. “If they do... fine, the club has a decision to make. We have got a valuation and if it is met it is the club’s decision.